I have been scrapbooking for something like 7 years, the last two have been almost completely digital. One of the things I love about the switch to digital is the ability to use templates. A second thing I love about digital is the ability to use VERY large photos on my pages. 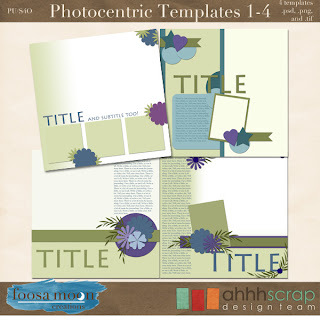 I have combined those two loves in my newest template pack: Photocentric Templates. These templates are available at my Ahhh Scrap store. And remember, my whole store is on sale 30% off in celebration of my grand opening! The sale lasts until the end of the month, so there are just a few more days to take advantage of the sale.